mwvm is a solo project form British guitarist/electronic musician Michael Walton. 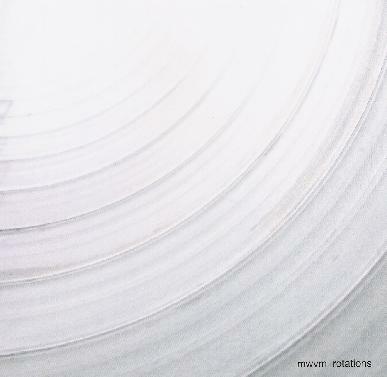 Rotations is his debut CD. Throughout the album Walton takes basic themes and gradually builds on them, exploring all their possibilities. Multiple guitar elements, both crisply melodic and soundscape ambient, come together to create mood building voyages that are like sonic brushstrokes on a cosmically pastoral aural landscape. The music is completely free in its exploration, yet always struck me as having a sense of direction. It's both abstract and well defined in its structure. Space ambient fans will find much to enjoy here. Some of it brought to mind a blend of Eno and early Tangerine Dream. Other parts are like minimalist Pink Floyd. We've got massive earth shattering drones. But the music is for the most part thoughtful, calm, and highly image inducing. Much of this would make excellent film soundtrack music. The CD includes 10 tracks, though each transitions smoothly into the next. That's a plus for me because I like to settle in and surrender my thoughts to music like this, and the continuity makes for a fuller album experience. For more information you can visit the mwvm web site at: http://mwvm.co.uk. Hear music at the mwvm Myspace page at: http://www.myspace.com/mwvm. Visit the Silber Records web site at: http://www.silbermedia.com.